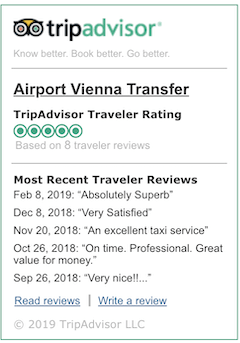 Taxi Airport Transfers | Vienna | No Cancellation Charge! "Will my vehicle be shared or is it private?" "All bookings are for private transfers and you are the only passengers on the vehicle. This means that no other passengers are expected to arrive and no further stops will be done." Most of our vehicles, while driving, are fitted with car seats for children. In the booking form you will be given the opportunity to add as many chairs as you want. TAXI AIRPORT TRANSFER takes very seriously the safety of all passengers, especially children. If you travel with pets, please fill out an additional request form. Your request will be answered within one working day. Any additional costs for credit card payments? Yes,we charge an additional 3 EUR cost for the credit card payments. I`ll need an invoice for the company. Can you offer me one after purchase? Yes. Please contact Customer Service and we can provide you with an EU VAT invoice. Airportviennatransfer.at accepts all online bookings up until 24 hours before your planned transfer. If you need a transfer within the next 24 hours please call our customer service team and we will check our availability and do our best to provide the service. The details of the place where you will meet the driver are provided on your booking voucher. The driver will wait for you in the arrivals room until you get your luggage and you will cross Customs. If you are expecting from hotel, the driver will meet you at the hotel reception. If you are expecting from a private apartment or villa, please wait for the scheduled time of pickup. In other cases, please provide us with an address and specific details, such as the cathedral, clock, landmark, etc., where you want to be expected. How much time the driver expect me at the established point? The driver will monitor the flight arrival time and wait until 1 hour after the plane has landed. If a member of your group is remanded when checking baggage or customs, please send one of your group members to meet and notify the driver. For airport transfers, the driver waits for a maximum of 10 minutes after the scheduled time. If you are unable to contact us through the 24-hour support number within these set deadlines, you may be left unattended. If you want that your driver to wait for you, every 10 minutes will be charged 5 €. All our drivers monitor your flight status to make sure you are waited on time, regardless of any minor delays your flight may experience. If your flight number changes, is rescheduled or experiences major delays (more than 2 hours) please call the 24/7 Assistance Line provided on your Booking Voucher. What if I can't find my driver? In the rare case that you cannot contact your driver, please call the 24/7 assistance number provided on your Booking Voucher and our Customer Service team will immediately assist you. How can I pass on my thanks, comments or suggestions? Shortly after your trip we’ll send you a brief questionnaire where you can let us know how your trip went as well as offer us any suggestions or ideas for the future. You can also send us an email anytime to office@airportviennatransfer.com.